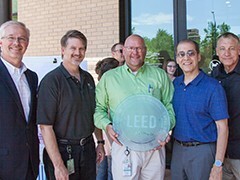 The director of the Colorado community of the U.S. Green Building Council (USGBC) on Thursday, June 8 lauded the City of Fort Collins as she awarded the City the state’s first-ever Platinum LEED v4 designation for new construction. That’s a fancy way of saying the new Fort Collins Utilities Administration Building, 222 Laporte Ave., is one of the most energy efficient, environmentally sustainable buildings in the nation. Patti Mason of USGBC thanked City leaders for setting higher standards as she presented the award at the public ceremony with City staff and elected officials, leaders in the construction industry and faculty from Colorado State University. Platinum is the highest achievable designation for energy efficient buildings awarded by the Green Building Council. LEED stands for Leadership in Energy and Environmental Design. The City’s building is the fourth building in the world to achieve the v4 Platinum designation. Three are located in the United States. More than 95 percent of the construction waste was diverted from landfills (30,500 bricks were repurposed from the former creamery that once sat on the site). Roof-mounted solar panels producing 105 kilowatts of energy will offset 50 percent of energy costs. The building features the only perennial living wall in Colorado. Landscaping includes more than 7,000 square feet of low-water plants. About 90 percent of the occupied spaces have daylighting and views. The building saves the City about $50,000 a year in energy costs, said Brian Dunbar, executive director of the CSU Institute for the Built Environment, which managed the LEED certification process on the project. Dunbar is one of only 200 LEED Fellows in the country. The typical office building is designed to achieve performance of 93 kilo-British thermal unit (kbtu) per square foot, which is a standard measure of energy usage. The City’s new building was designed to achieve 26 kbtu per square foot and actually achieved 11. By comparison, the City’s building at 215 N. Mason achieves 40 kbtu per square foot. Only 10 percent of Colorado LEED projects achieve LEED Platinum certification, Mason said. Dunbar also thanked the City for being willing to lead by example, noting the City used a more recent, more intense rating system instead of taking the easier path of using the less difficult 2009 version. “This project served as a great public-private partnership where we learned from each other along the way, and that only benefits the community,” said Tim McCollough, Fort Collins Utilities Light and Power Operations Manager. This City project shows the community how cost savings, operational excellence, carbon reductions and quality of life can work together, Dunbar said. He noted that three CSU graduate students benefited by “rolling up their sleeves” to work on the real-life development. USGBC has also highlighted the building as a case study for its members.